SSC MTS Re-Exam 2016 has started on 16th September and first phase finished on 22.09.2017. Second Phase started on 3rd October and finishes on 16 October 2017. Today (26.10.2017) is the sixth day of third phase. 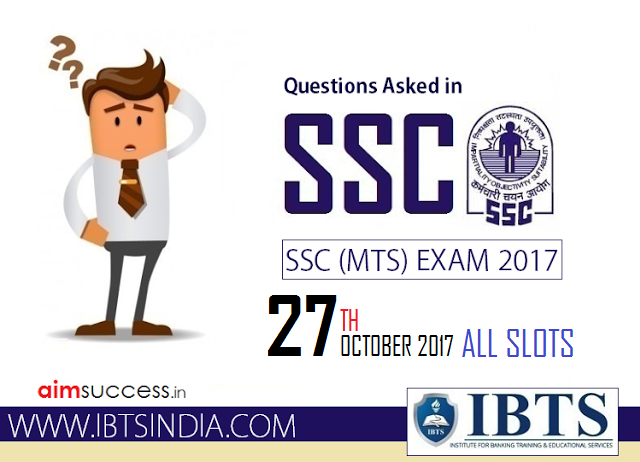 We will be sharing with you the Analysis and Questions Asked in SSC MTS Exam 27 October 2017. SSC MTS Exam covering all the shifts and all sections viz.General Intelligence & Reasoning, Numerical Aptitude, General English and General Awareness.This will be beneficial for the aspirants who are going to appear for SSC MTS Exam on further dates. We request candidates who had given exam today to please share the questions from your memory below in comment sections. Our experts will try to provide the accurate answers for your questions. IBTS INDIA - India's Leading Institution for SSC Exams Coaching in Chandigarh.